Keep power lines away from your trees! We all have to do our best to stay prepared for the forces of nature. With that said, it’s important that we keep our trees property pruned and trimmed, especially those near power lines. Not only could this pose a danger to our homes and neighbors, but trees that hit power lines could also leave the entire neighborhood in the dark for an extended period of time. Here are some tips for keeping power lines away from your trees. It’s true that you might have a green thumb and do a great job of pruning and trimming your trees on your own. However, when it comes to working near power lines, it would be best to call professionals for the job. Professional tree services are experienced with working under these circumstances. Not only that but they have the necessary tools, equipment, and specialized training to get the job done efficiently and safely. 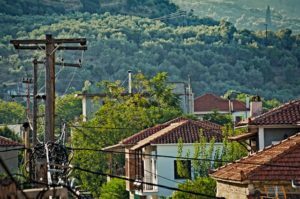 High-voltage power lines are extremely dangerous, especially for your average homeowner. It may also be necessary to contact the utility company as they might have a protocol in place for dealing with these kinds of dangerous situations. Overall, keeping power lines and trees a safe distance from each other is a task that requires specialized equipment and training that most homeowners don’t have. There are many benefits that come from keeping power lines away from your trees, including an enhanced peace of mind. With the unpredictability of weather, it’s necessary to stay prepared for all situations. The utility company and tree-trimming professionals are both fully aware of the dangers that come with branches falling on power lines. You’ll be able to rely on the services they provide to get the job done before an impending storm creates a dangerous scenario. Furthermore, the added benefit of a neat and tidy landscape works well with the other work that you do keep up with the appearances of your property. This entry was posted on Friday, June 15th, 2018 at 12:26 pm. Both comments and pings are currently closed.